Mexican food is hot! 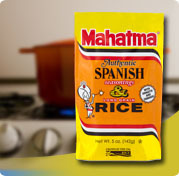 For an authentic South-of-the-Border taste for your next meal, try the Mahatma Spanish rice mix made with tomatoes, onions, bell peppers and Mexican spices like annato and cumin with a touch of paprika. Annato seeds are used to add a rich yellow/orange color. They are also known as achiote. Bring 1-2/3 cups of water, 1 tablespoon ketchup (optional), and 1 tablespoon margarine to a boil in a medium saucepan. Stir in rice mix, cover, reduce heat and simmer for 20 minutes. Fluff lightly with fork and serve. In a 1-1/2 quart microwave safe dish, combine 1-2/3 cups hot water, 1 tablespoon ketchup (optional), and 1 tablespoon margarine, and rice mix. Cover and microwave on HIGH for 3 minutes, reduce setting to 50% power and microwave for 17 minutes. Fluff lightly with fork and serve. If your microwave does not have variable power settings, follow manufacturers directions. 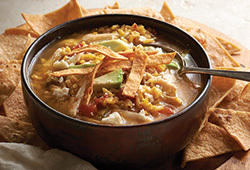 In a medium saucepan, combine 1-1/2 cups water, 1/3 cup salsa, and 1 tablespoon margarine, bring to a boil. Add rice mix, reduce heat and simmer for 20 minutes. ENRICHED LONG GRAIN RICE [RICE, NIACIN (NIACINAMIDE), IRON (FERRIC ORTHOPHOSPHATE), THIAMIN (THIAMIN MONONITRATE), FOLIC ACID], SPANISH SEASONING [DEHYDRATED VEGETABLES (ONION, TOMATO, RED AND GREEN BELL PEPPERS), SALT, MONOSODIUM GLUTAMATE, MALTODEXTRIN, SPICES, DEXTROSE, TURMERIC EXTRACT (COLOR), ANNATTO EXTRACT (COLOR), PAPRIKA EXTRACT (COLOR), PARTIALLY HYDROGENATED VEGETABLE OIL (SOY, COTTONSEED), SILICON DIOXIDE].